Yes, Elizabeth, I think you're right...N. West St., not Water St. as I had originally thought. 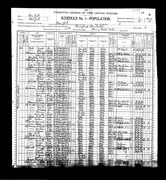 I haven't seen the 1900 census...are you able to post the link here? Thanks for the census records, Elizabeth. I'm unsure if this Gregare family is related to my Maria. According to my mom, Maria had no siblings; and she told me Vincenzo only had a sister (who looks to be Teresa). As well, I'm unsure if this is my Maria and Vincenzo Ali(a) on page 2. I have the 1910 Onondaga County (Syracuse, NY) census, which conflicts with this 1900 census regarding their ages, number of years married, mother of how many children, years of naturalization, etc. Elizabeth, are you able to read what Vincenzo's occupation is? I'm 99% sure it says tailor. Alright, you two! LOL! Okay, so my 2nd cousin told me that Vincenzo was a cobbler in NYC probably around 1900 or 1901. A cobbler fixes shoes, right? So, could a tailor also be a cobbler or vice versa? Hehe..sorry Lynne, but we couldn't help ourselves! I think this looks more like your Vincenzo.. But I'll wait for your confirmation. My grandfather was a barber but also was a cobbler and wine maker. No need to apologize, Nuccia. I thought it was pretty funny myself! Yes, this is my Vincenzo...Rosina and Cristina were by great aunts, and Teresa was my grandmother. They lived at 112 West Laurel Street in Syracuse. See where it says mother of how many children? 5 - and how many children still living? 3. It seems as though there were 2 children who passed away...how could I find out this information? I have been thinking about this...have you tried the local court office to see if any deaths are registered? Do you know the local parish which they may have attended? About a year ago, I received info on the births of my great aunts (Rosina, Cristina, and Carmela) and one uncle (Vincenzo...they could not find Joseph's info), as well as my grandmother, Teresa, from St. Peter's Church. I assume this was the church they attended while living on West Laurel Street. (I received the above info from Our Lady of Pompeii Church, which has retained the records from St. Peter's Church since its closure in June of 2008). Have you tired the local cemetery in that area or contacting the people on Find a Grave? Or a local library? Sometimes the librarians can be very useful in locating information - the one in Trinidad Colorado found my grandmother's baptism records and a few other things that I never thought of. Thank you for the info, Nuccia. My plan is to visit Assumption Cemetery where my GGP are buried the next time I'm in Syracuse. As far as Find a Grave, how are they able to help? I've never used their website before.